The problem that many have with this election is the quiet support of the fast, uncontrolled growth activists for Navarro. She openly accepts contributions from developers, PACs, special interests and land use attorneys. She is not willing to place limits on those contributions. My belief is that this could lead to a conflict of interest any elected politician making decisions regarding land use issues. The fear of many of us is that if Navarro is elected, the faster, uncontrolled growth advocates will have a majority on the council once again. Furthermore, a Navarro victory might enable a more developer and business-friendly majority on the council to fill the two vacant positions on the Park and Planning Board. During the only negative exchange in the meeting, Praisner took issue with a Navarro comment in response to a moderator’s question about campaign financing and avoiding undue influence. Navarro had said she was financing her campaign as Marilyn Praisner had, with contributions from many sources, including business interests. On Monday, Donald Praisner said that only Navarro is taking money from developers and that Navarro may “undo some of the work my wife did,” referring to provisions supported by Marilyn Praisner and passed by the County Council designed to slow the pace of growth. Neighborspac, a MoCo activist group that opposed overdevelopment, raised the issue of politicians and development contributions starting in the 2002 county races. Neighborspac began tabulating contributions from development-connected people or entities and reporting them as a percentage of the total receipts for each candidate. Neighborspac had a point: if a politician received an overwhelming percentage of his or her support from one industry, like real estate, voters had a right to know that. I certainly looked at Neighborspac’s data in 2006 before casting my votes. But since then, the issue has mutated. Now the standard is not whether a politician accepts an overwhelming majority of his or her contributions from business, but whether a politician accepts any contributions from business at all. Because Navarro has refused to rule out any business contributions, she is accused of being controlled by them. This is a difficult test for any politician to pass, including a very prominent one who is relevant to this race: the late Marilyn J. Praisner. 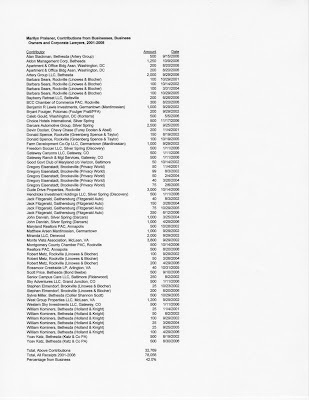 According to state board of elections data, Mrs. Praisner raised a total $78,056 between 2001 and 2008. Of that total, $32,769 – a full 42% – came from businesses, business owners or corporate lawyers. See the graphic below for the specific contributions. Among Mrs. Praisner’s contributors was Bryant Foulger, head of construction and real estate giant Foulger Pratt, who gave her $200. That firm is a partner in Downtown Silver Spring developer PFA, against whom a First Amendment demonstration was launched last summer. Companies and relatives of Aris Mardirossian contributed $3,000 to Mrs. Praisner. Mardirossian, developer of Crown Farm in Gaithersburg, is infamous in MoCo for suing civic grand-daddy Wayne Goldstein for the mere act of writing him a letter. Three Linowes and Blocher lawyers contributed a total of $975. And four limited liability companies from Colorado gave Mrs. Praisner a combined total of $2,000 in 2006. So what has Nancy Navarro done to justify treating her differently? Why is she the only candidate to be attacked by illegal, anonymous robo-calls? Why is she the only one accused of being controlled by “special interests?” Why are her critics making an issue of this before she has filed a single campaign finance report? What we have here is the Politics of Paranoia. Taking a single dollar from a business buys off your integrity and makes you their slave. Or at least that’s what Navarro’s enemies would have you believe. My advice is to vote the old-fashioned way. Grab the politicians by the lapels. Determine whether they agree with you on the majority of things that you care about, whether they are capable enough to deliver on those priorities and whether you think they are people of good values. If they pass those tests, vote for them. If they don’t, find someone else to vote for. No political jihads. No illegal robo-calls. Just you, your brain, your heart and your vote.